These athletic dogs may look indestructible, but they are big softies at heart. The males are larger and stockier than the females, but both are loyal, gentle and outgoing. American bulldogs were bred as working dogs for guarding and hunting larger game (and, unfortunately, as fighting dogs). They are very protective of their family, but can be weary of strangers. That said, with the right amount of obedience training, they can be taught to recognise what constitute an actual threat. Early socialization is also very important, to avoid shyness and fear aggression (this will not take away the dog’s natural protective instinct). They love children, but may not be suitable for very excitable young ones. They require plenty of exercise to keep them calm indoors and healthy. They are prone to hip dysplasia, skin problems (such as mange and ichtyosis), eye disorders, allergies and thyroid problems. They are easy to groom and are average shedders. 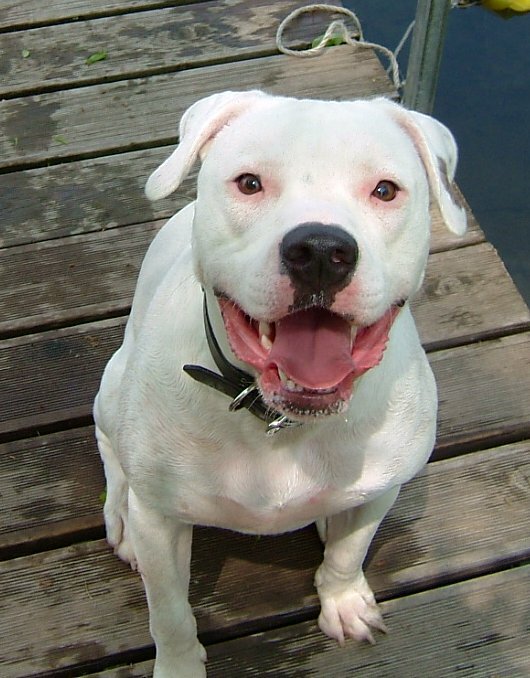 By joining this group, you club together with other owners to get a great deal on dog insurance for you American Bulldog. A straightforward pricing approach that gives great value for your Bulldog, with an additional £15 cashback* on top!